Kenda Murphy is an experienced, highly sought lawyer with over 20 years of experience in civil and criminal litigation. As a workplace and institutional investigator, she is relied upon by clients for her calm, efficient, and clear-sighted approach to even complex and fraught situations. In addition, her work as a trainer has enabled employers and employees from sectors across Canada to establish more resilient and harmonious workplaces. At Rubin Thomlinson, Kenda conducts workplace investigations into harassment, bullying, poisoned workplaces, and Bill 132 complaints. Kenda also conducts workplace audits that delve into the underlying causes of low productivity, poor morale, communication issues, and interdepartmental conflict. Kenda is also available to her clients to work on the implementation of appropriate avenues of resolution including, but not limited to, restoration, mediation, and facilitation. Kenda is also able to deliver these services in French. Kenda also assists her clients by providing training to staff at all levels on conducting workplace investigations and human rights issues in the workplace. Over the course of Kenda’s career, she has been in private practice and worked in the public sector with the Public Prosecution Service, Department of Justice and Health Association Nova Scotia. Most recently Kenda was the Associate Director & Counsel of the Employee/ Labour Relations Unit at Queen’s University. 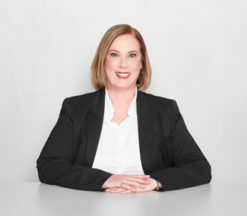 Throughout her career, she has negotiated collective agreements on behalf of Employers in the acute care, continuing care, and university sectors. She has represented clients at all levels of courts, including the Supreme Court of Canada and the courts of Appeal in New Brunswick and Nova Scotia, and at various administrative tribunals. Kenda spent a number of years as part-time faculty at Saint Mary’s University where she taught Human Resource Management and Industrial Relations and is an accredited creator of the test bank and power point presentation for the 2nd, 3rd and 4th editions of Fiona McQuarrie’s textbook, Industrial Relations in Canada. Post-Investigation Mediation – to Read the Report or Not to Read the Report?